Groundnut: this North American native has a lot going for it. Great photo of Groundnut’s tuber chains. North America’s most well known native root crop, although it is not very well known by most people. 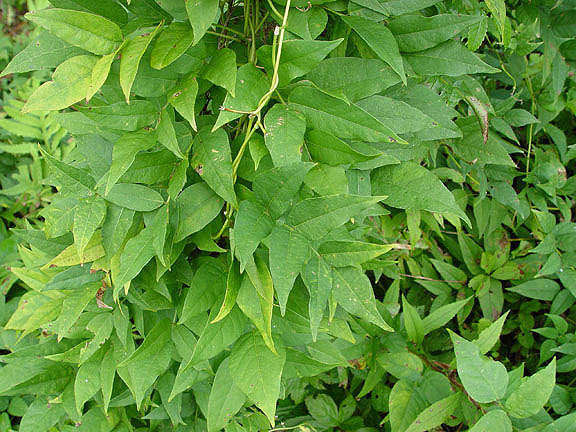 It is a large, vining, herbaceous plant with small to large tubers (grape to grapefruit sized) that have an earthy, nutty taste somewhat between potatoes and peanuts or roasted sweet potatoes. 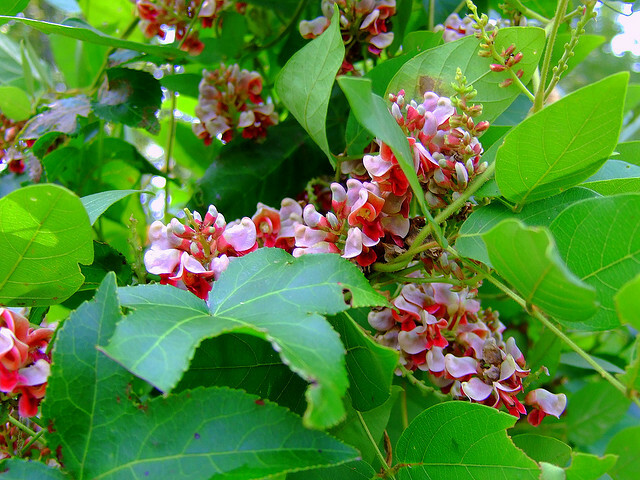 It is also a nitrogen fixing plant… it puts nitrogen back into the soil. It is a good attractor of beneficial insects and is a fair groundcover plant. If you have a medium to large area that this plant can spread, then strongly consider adding Groundnut to your Edible Forest Garden. Groundnut tubers cleaned and ready to be trimmed and cooked. Groundnut is native to eastern North America, and it was an important food crop for Native Americans and European settlers. It was often transplanted by Native Americans where it often naturalized near their settlements. Recently there has been a lot of improvement work done on Groundnut by Southern Louisiana State University. Groundnut is a starchy root crop with a high protein content – improved varieties have up to three times the protein at potatoes. Groundnut (Apios americana) should not be confused with other plants sometimes called “groundnut”, like the common peanut (Arachis hypogaea). 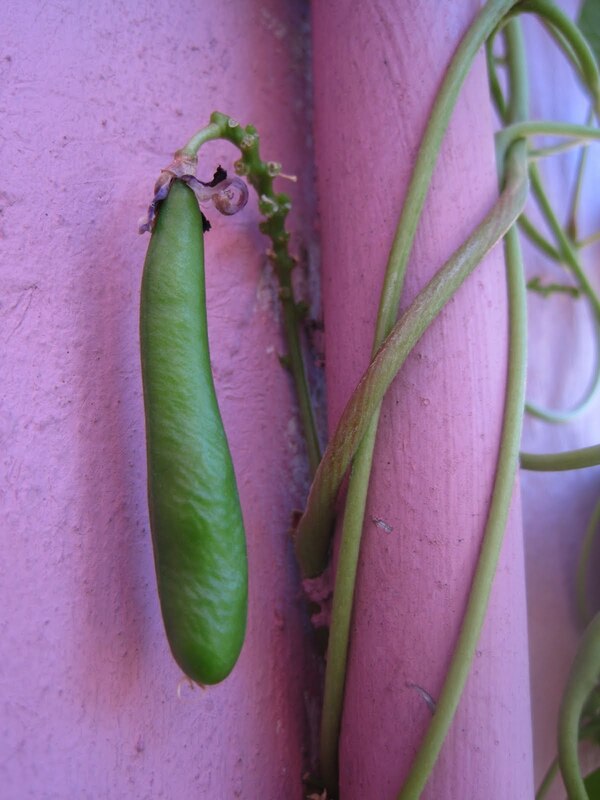 Groundnut’s seedpods can be eaten like beans, but the larger pods may be a bit fibrous. 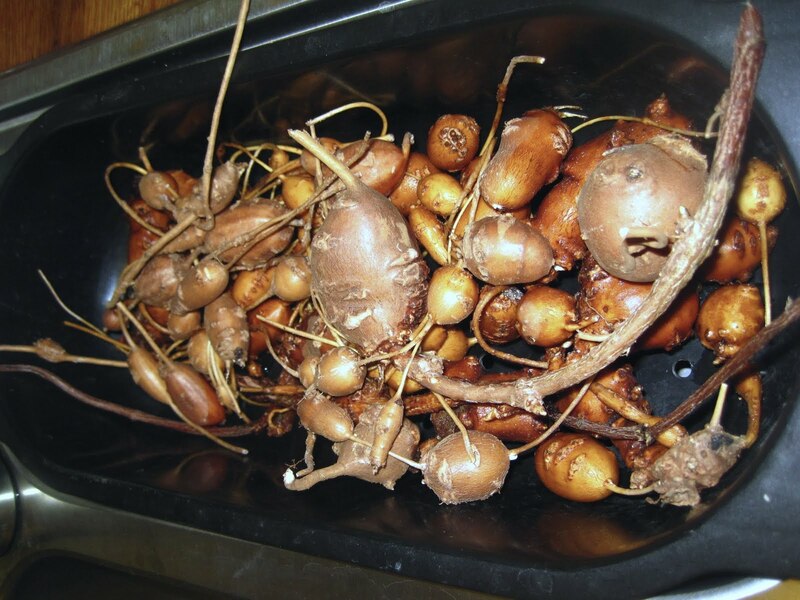 Edible Root Crop – must be cooked. Treated like other root crops. May become dry and mealy if not cooked the right way (it can easily be cooked too much). Boiling for 10-15 minutes is all that is needed. 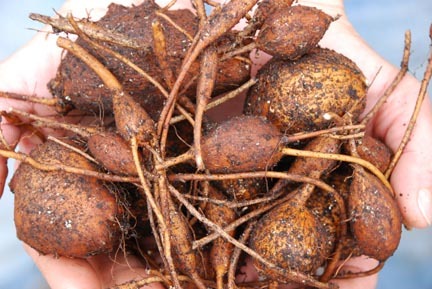 Tubers can be harvested at any time of year; although they are often harvested in Fall and Winter (October-March). For those of us who desire to grow these as perenials, there is a technique for harvesting the roots without destroying the whole crop. Roughly divide the planting into 3-4 parcels. Each Fall or Winter, harvest one parcel, and leave the others to grow for another season or two. Rotate each season. Since tubers can be harvested at anytime, and since Groundnuts store best in the ground, some choose to only use fresh Groundnut straight from the garden. However, Groundnut can be stored in a moist, dark location (like in a plastic bag in a refrigerator) for up to a few months if conditions are right. Just avoid letting the tubers dry out as this can easily happen and ruins the crop. …and have a scent like violets. AHS Heat Zone: No reliable information on this. 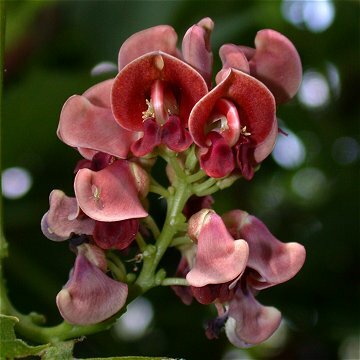 Chill Requirement: No reliable information on this; however, they can thrive in locations with hot and humid summers and do not grow well in the tropics. This causes experts to think that Groundnuts need some chill for proper growth and development. Cultivars/Varieties: There are a few improved varieties available. 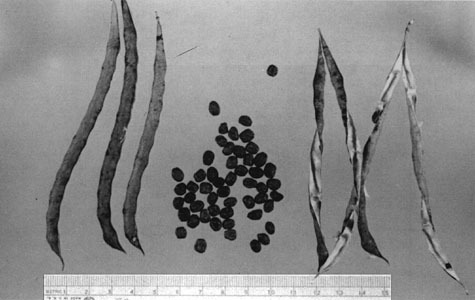 Seeds and seedpods of the Groundnut (with ruler in centimeters). Groundnut has fairly distinct foliage. May be slow to become established, but once it is established it can be expansive. May be a plant reserved for medium to large forest gardens. Groundnut needs a trellis or other structure (non-fruiting tree?) on which to grow or it will need lost of room for expansion over the ground. Consider rhizome barriers if your space is limited and your tolerance of spread is low. 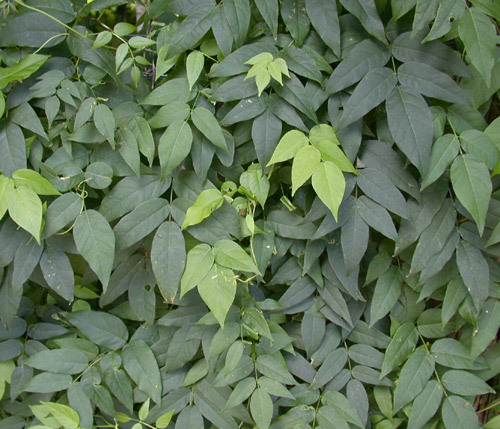 If growing Groundnut as a groundcover, then space the plantings 12-18″ (0.3-0.4 meters) apart. It is a medium density groundcover plant, so it is best interplanted with other medium density groundcover plants (like lowbush blueberry, lignonberry, groundcover raspberry, thyme, yarrow, strawberry, violet, chives, chamomile, oregeno, etc. )… considering its ability to fix nitrogen and grow in acidic soils, blueberries and lignonberries are natural permaculture partners. Groundnuts can be susceptible to parasitic nematodes in the deep South U.S.
Usually, and most easily, by division of the tubers. 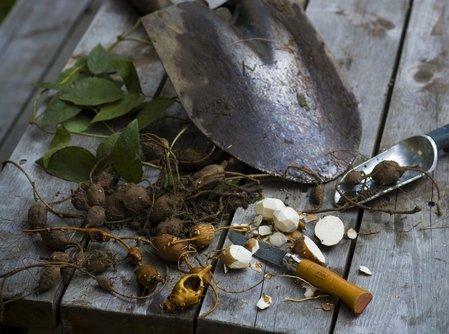 May replant either a whole string of tubers or each tuber individually. Reported to become dormant for a season if not divided in the Autumn. Can be propagated via cuttings. May be propagated via seeds, but this is more difficult as germination can be difficult, seeds need scarification and soaking for at least 3 hours, and not all seeds are fertile. Minimal once established. May need to keep its growth in check with vigorous pruning/tuber harvesting if it becomes expansive. 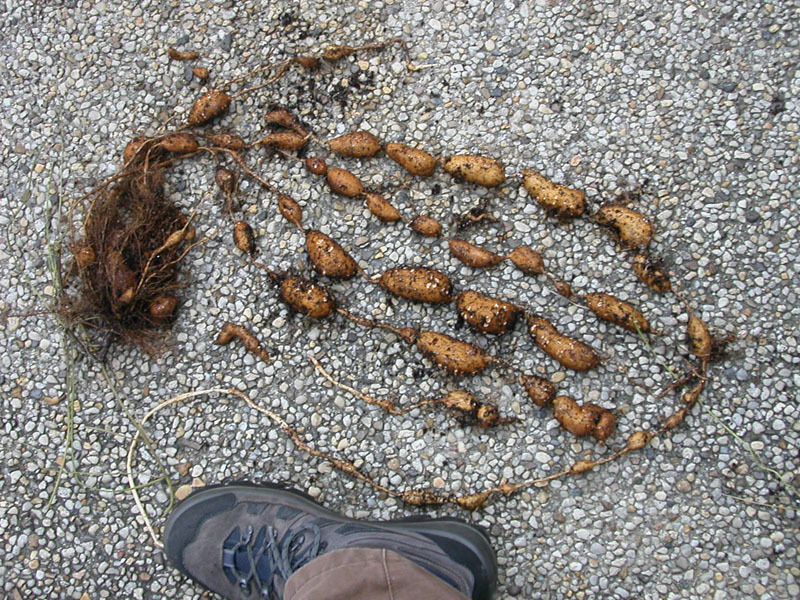 Next Hopniss: North America’s best wild tuber?